The Clube Naval de Cascais, affiliated to Portuguese Sailing Federation organizes the XXIV King Juan Carlos I Trophy - IDA Grade 1 event - in conjunction with the Portuguese Dragon Association under the supervision of the International Dragon Association (IDA). 2.1. Advertising will be restricted to WS Regulation 20.4. 2.2. Competitors may be required to display advertising chosen by the event organizer in accordance with WS Advertising Code. Any required advertising material and instructions for their use, shall be distributed at registration. 3.1. The regatta is open to all boats of the Dragon class. 3.2. 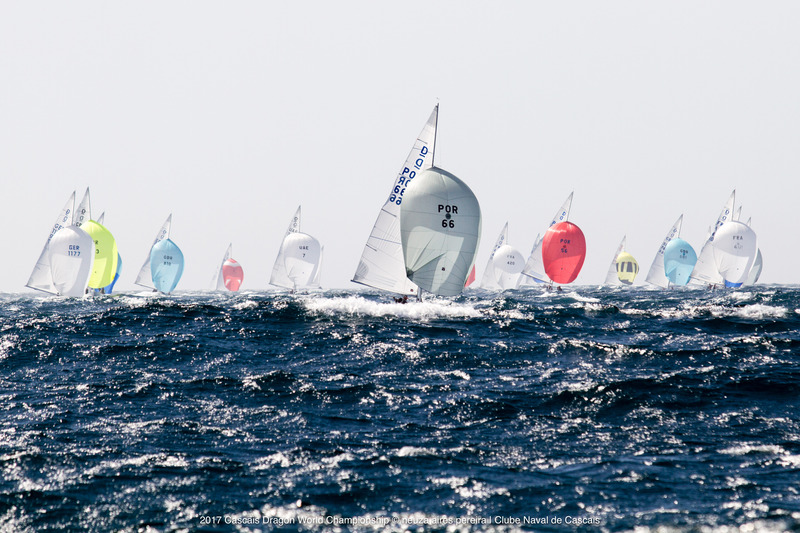 Eligible boats may enter by completing the online entry form available at the event web site at www.cncascais.com by 25/04/2019. 3.3. The Organizing Authority reserves the right to accept entries after the established deadline. 3.4. Each boat has to present at registration a copy of the boat insurance policy, a copy of the boat measurement certificate and the Sails Registration Form. 3.6. No fees are refundable after the entry closing date. Before that date entry fees will be refunded after deducting 50% for administration expenses. 3.7. For non-Portuguese Boats, the entry fee includes 30 days FREE parking in between the regatta dates (15 days before & 15 days after) with unlimited craning and in water mooring in the Club buoys, including on training days. 3.8. Boats wishing to be scored as Corinthians must refer and declare it in the entry form, and shall include a complete crew list and show the classification, WS I/D number and classification expiry date for each crew. 5.1. Entry confirmations and crew weighing will be made on May 1st from 9am to 1pm. 5.3. Number of races: 8 races are scheduled. 5.4. It is intended to sail two races per day. However, an extra race may be sailed in exceptional circumstances. 6.1. All Dragons must have a valid Measurement Certificate according to the rules of the International Dragon Association. Copy of this Document should be presented at registration. 6.2. All Dragons must deliver at the Race Office during the Registration Period, the Sails Registration form dully filled and signed by the boat skipper. 6.3. All Sailors must be presented to weight control during the Registration Period. 8.1. The regatta will be held on the Clube Naval de Cascais facilities. 8.2. The races will be held on Cascais Bay or in Guia race areas. 11.1. Three(3) races is required to be completed to constitute a series. 11.2. There will be one discard when five races or more have been completed. 12.1. Team leaders, coaches and other support personnel may use “support craft” to assist their competitors on the water. They shall register at the regatta office prior to the first scheduled race, providing details of their boats and distinctive identification, which shall include flying a WHITE flag showing the national 3 letter code in BLACK (minimum height 120mm), of the country of origin. 12.2. Coach/support boats shall not tow competitors out to the race course (unless requested to by the Race Committee) and may only tow boats in after the last competitor has finished. 12.3. Subject to SI, team leaders, coaches and other support boats shall stay more than 150 metres to leeward of the starting line and from the leeward marks and from any racing Dragon from the time of the preparatory signal until all boats have finished the last race of the day, or all races are abandoned. Support boats may be allowed up the course on one specified side only if special dispensation has been granted by the IDA (via application to the Jury) for reasons of safety, health, tourism, spectating, or sponsor’s request. Such boats applying for dispensation may not have a coach or WS category 3 sailor on board. Support boats that have been granted dispensation will be issued with a different colour flag to Coach boats. 12.4. At all times, support boats shall comply with the directions given by the Race Committee. In particular this includes assisting with rescues when requested to do so. 12.5. Coach/support boats shall not contact their connected boats between races. 12.6. Support boats must be on call on VHF Channel 8 at all times. 13.1. Boats shall be kept in their assigned places in the harbour. Boats will be moored on buoys in front of the club house and on pontoons at the Cascais Marina. 13.2. Allocation of berths will be made at the discretion of the Organizing Authority, and failure to comply with the OA instructions may be penalized. 13.3. The club can also arrange, at competitors costs, a berth at the Marina de Cascais, which must be requested in advanced. All yachts shall be afloat before 2pm on April 12, and shall not be hauled out during the regatta except with, and according to, the terms of prior written permission of the Jury. 16.2. The Race Committee may broadcast information available to all competitors by using VHF radio on race channel 8. 16.3. In the case of absolute emergency only, competitors may communicate with the Race Committee. 17.1. Prizes will be given to the top three boats, and the name of the overall winner will be engraved at the King Juan Carlos Perpetual Trophy. 17.2. Prizes will also be awarded to the 1st Corinthian boat. To be eligible to participate in this category, the Yacht must have a crew of amateurs submitting Corinthian Entry Form as well as presenting valid copies of WS Competitor Classification 1 Declarations at the registration period. Sailors not having, or having an invalid WS Classification, will be scored as GROUP 3, and will not be eligible to take part in this category. 17.3. The winner of the first valid race of the event will win the “Vincie” trophy. 17.4. The winner of the last valid race of the event will win the “Stavros” trophy. The organizing Authority has arranged a special parking package for the full event (Thursday to Sunday), with a cost of 32€ for the 4 racing days. These cards must be requested, until the end of the entry deadline, stated at point 3.2 of this Notice of Race, and will be delivered during the entry confirmation. Once received, the card must be used every time, when getting in and out of the Marina. All competitors must comply with RRS 55. We inform that this regatta will be certified by the Sailors for the Sea Organization.